Who doesn’t love their bedroom? They have become more than just restful spots only used after long tiring days at work! Bedrooms have transformed into an entertainment theatre during family movie night. They’re the place where we share pillow talk with our significant others and eat junk food while scrolling on our laptops. Bedrooms are warm and cozy hideaways that provide peace and privacy. Therefore, it is important to have a bedroom that matches your lifestyle and personality! In this article, you will find 30 fab bedroom ideas that are sure to give a personalized look for your sanctuary. 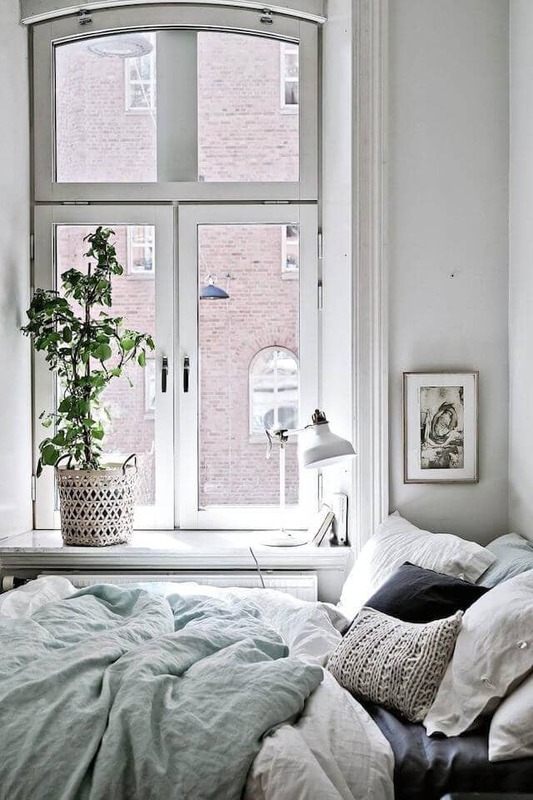 1) Crisp white sheets of heaven and the plant décor of earth! This room screams peace and meditation! 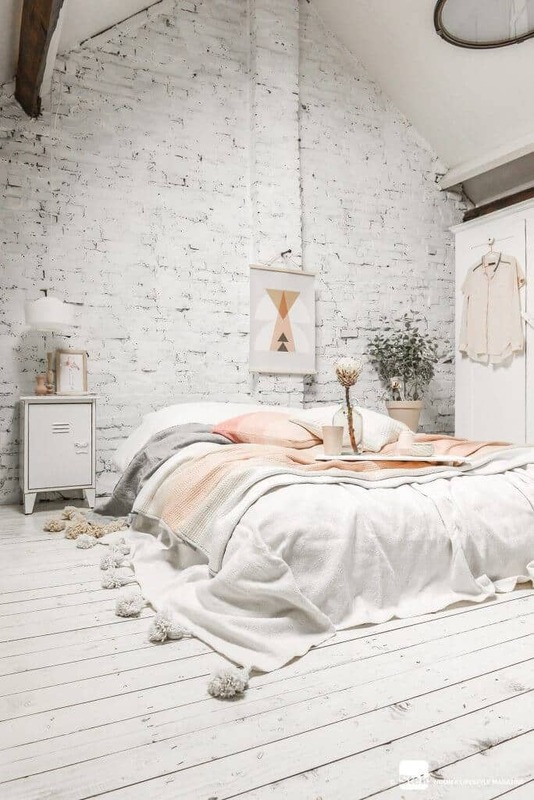 Your mood will instantly be brightened by this beautiful, white bedroom. The pink, teal, and white color scheme set the perfect tone for a happy day. Adding a green plant to the mix will add some life to the room and complete your perfect space to retreat to each evening. 2) Give your bedroom jazz with this adorable contrast of pink, black, gray, and animal print in this bed set! This chic bedroom design feels cozy with its plush pillows and warm knitted blanket. But, your bedroom will also inspire your inner fashionista when you see the shades of grey, pink, and animal print all day long! 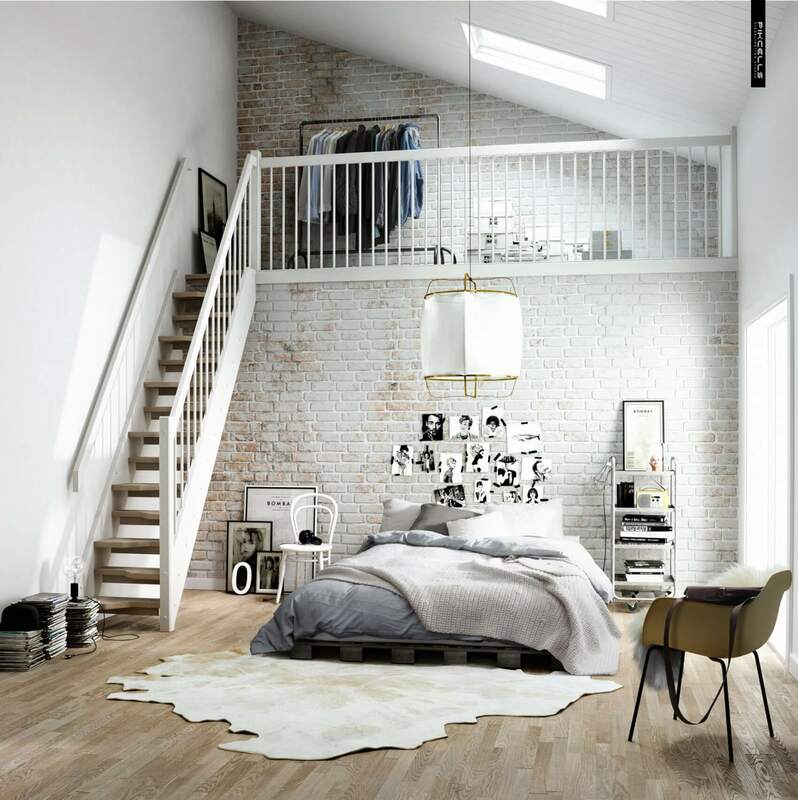 The trendy artwork above your bed is the perfect finishing touch to this adorable room. 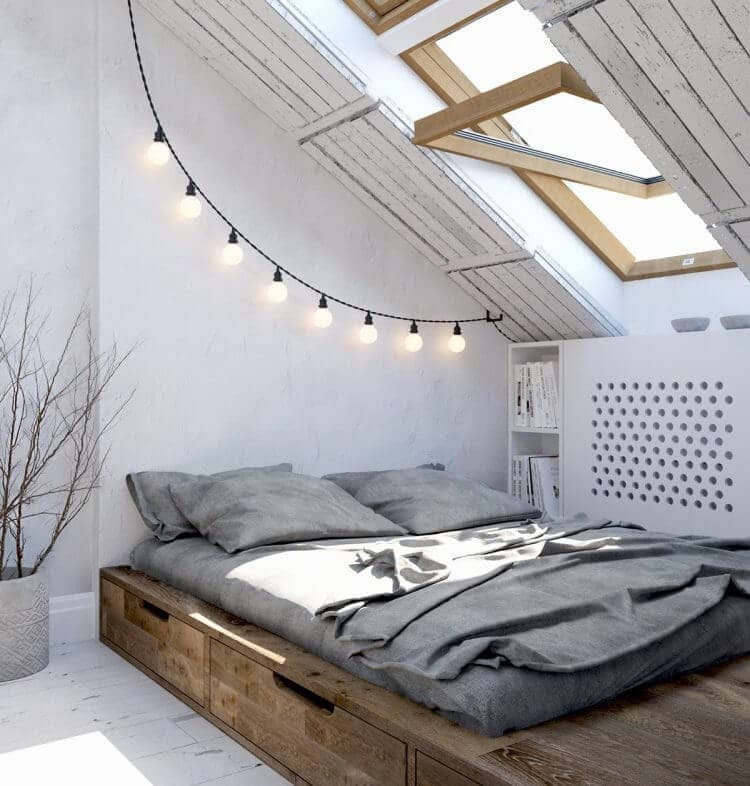 3) Lighting rules in this bedroom! 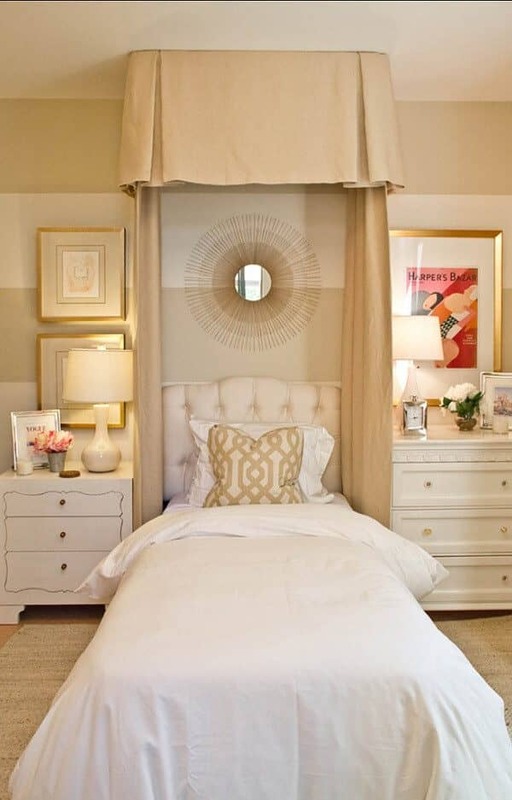 Who knew that light bulbs, a canopy, and a mirror above the bed could add so much character? Are you sleeping under the stars? No, it is just your super cute bedroom canopy that is disguising itself as a romantic night in the great outdoors. The otherwise sleek design of this modern bedroom will leave you feeling at peace with your new space night after night. 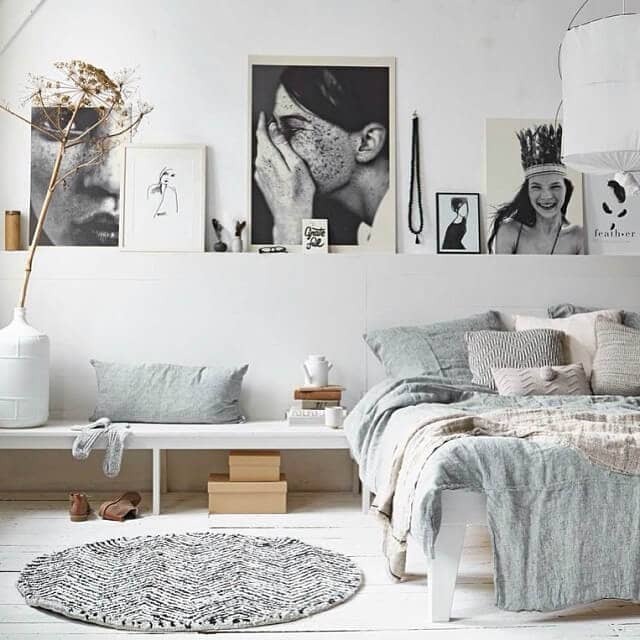 4) Style your room with a black white artistic approach! 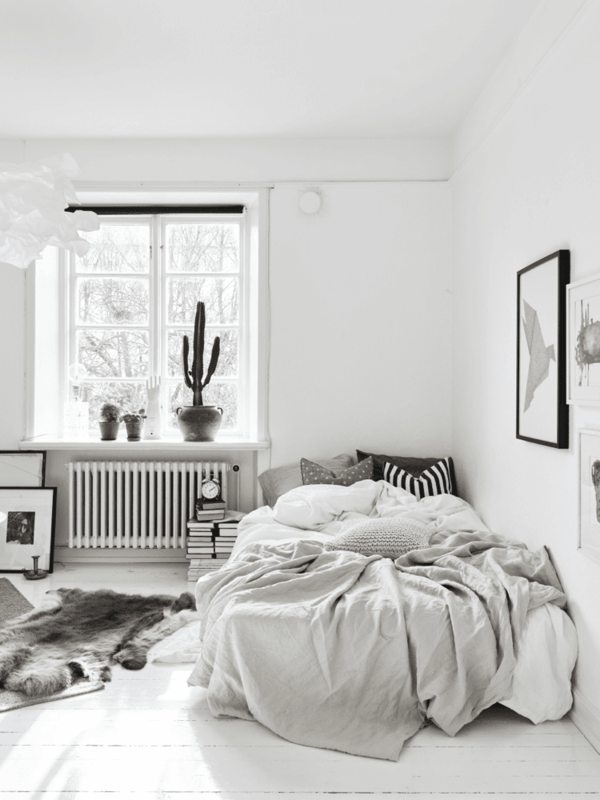 You really can’t go wrong when you decorate your bedroom in black and white. These contrasting colors are a simple way to bring a modern design to any room. Add a few pieces of art work and a splash of gold to create the perfect accents for this stylish bedroom. 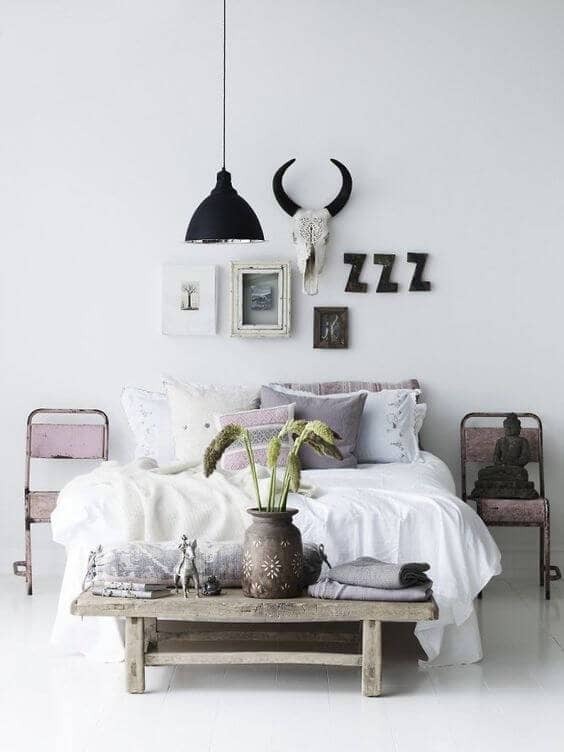 5) Shades of pink and an expressive headboard) Two words: Pure Elegance! If you are looking for a true designer bedroom, then go for a bold headboard to really make a statement. Don’t be afraid to pair this headboard with the elegant shades of pink that you see. The result is a very luxurious look that you will be proud to come home to every night. 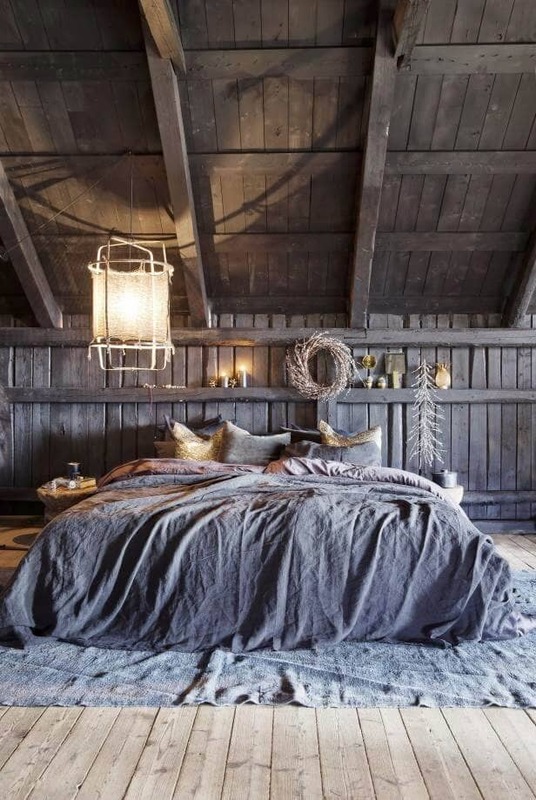 6) Low hanging light sets an intimate theme with this cozy bed! When thinking of bedroom decorating ideas, do not overlook the lighting. 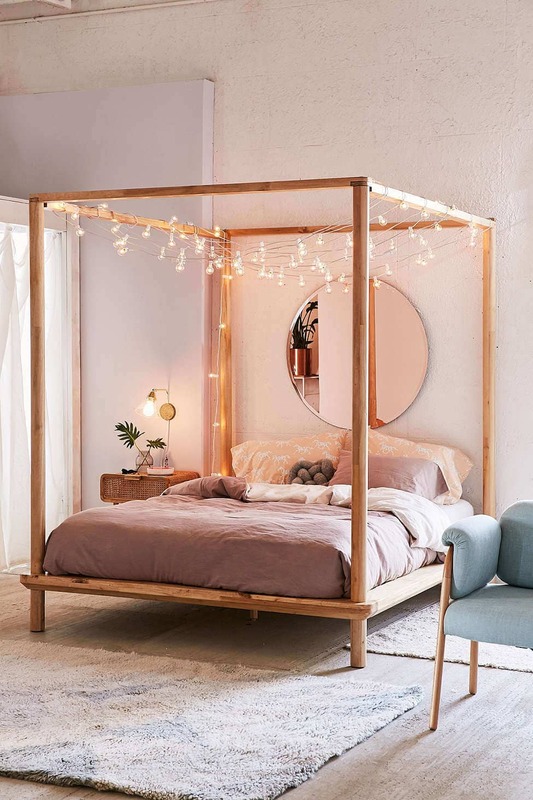 Lights are one of the best ways to influence your bedroom style. 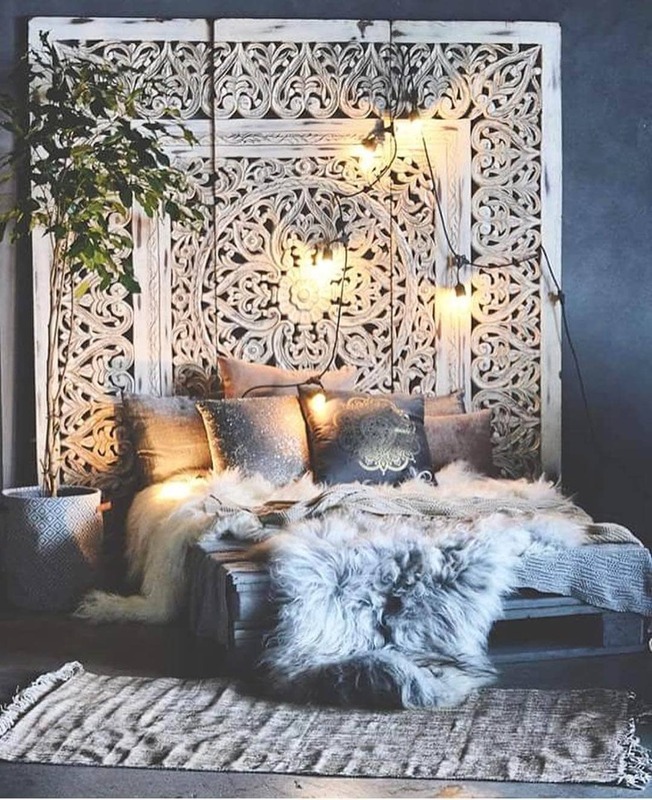 If you are going for a more natural feel, low hanging lights can provide that cozy setting that every bedroom needs. 7) The flooring in this room is definitely different from all the rest! The true definition of Fifty Shades of Grey! Make 2018 a bold year with one of our favorite interior design ideas… dramatic flooring! Your bedroom should not be a boring space only for sleep. Energize your bedroom interior with to give it a cool feel that you will be excited to come home to. You will love the fun that this bedroom style will bring! 8) This is an efficient room for multitasking, don’t you think? If you are looking for more natural bedroom ideas, this bedroom decoration is perfect. 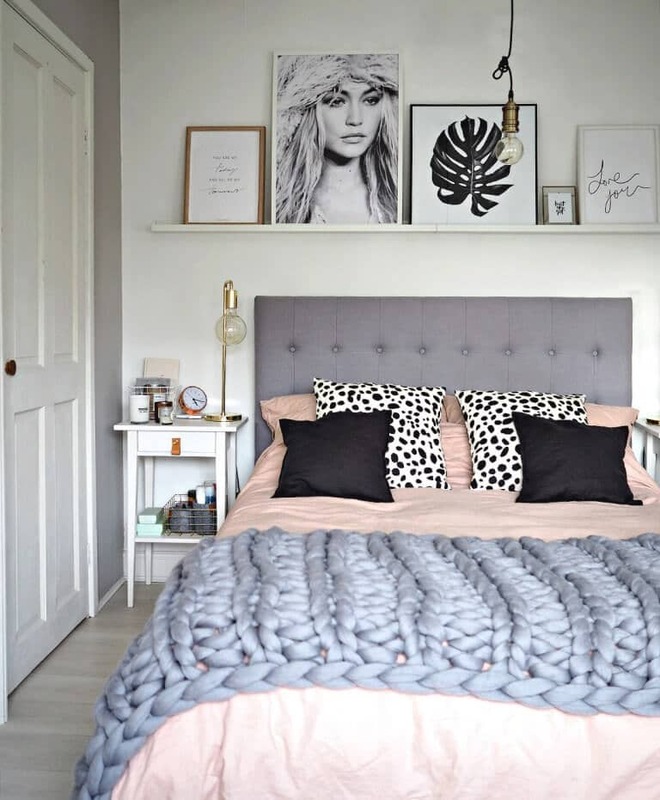 The wooden bed frame and headboard pair perfectly with the shades of grey and pink. The cute baskets, bowls, and bins that you see are not only perfect accent pieces, but they are a simple way to add some functionality to your bedroom interior. 9) Enjoy the magic in this twinkling sanctuary! Add a sting of lights onto one of interior design ideas. 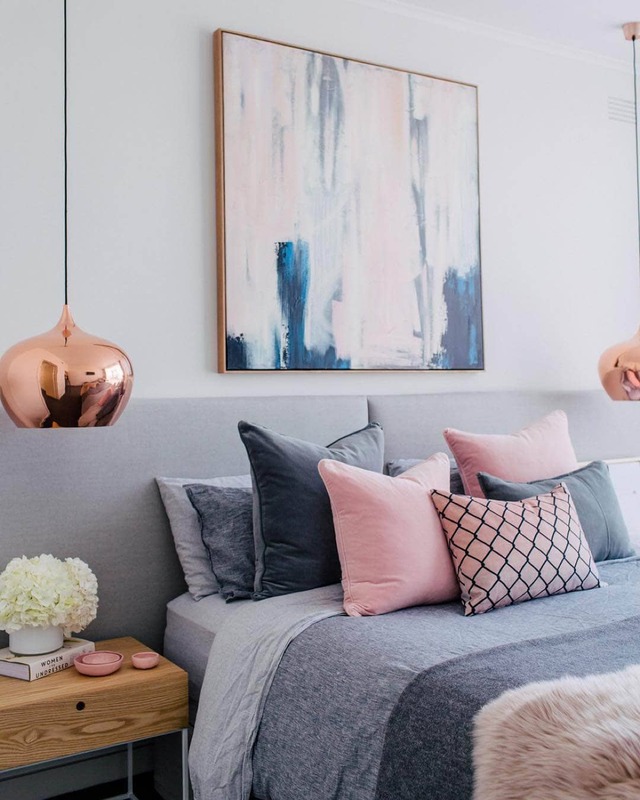 The lights in this room paired with the chic pink and grey color scheme give it a very fashionable feel. Add a pretty, plush blanket to really feel cozy in your space every time you come home. 10) Kick off your shoes and relax type of bed! Sometimes, simple really is best. The grey, white and gold color scheme in this bedroom design gives it a very modern look. White walls are a great way to give your space a cool and sleek feeling. 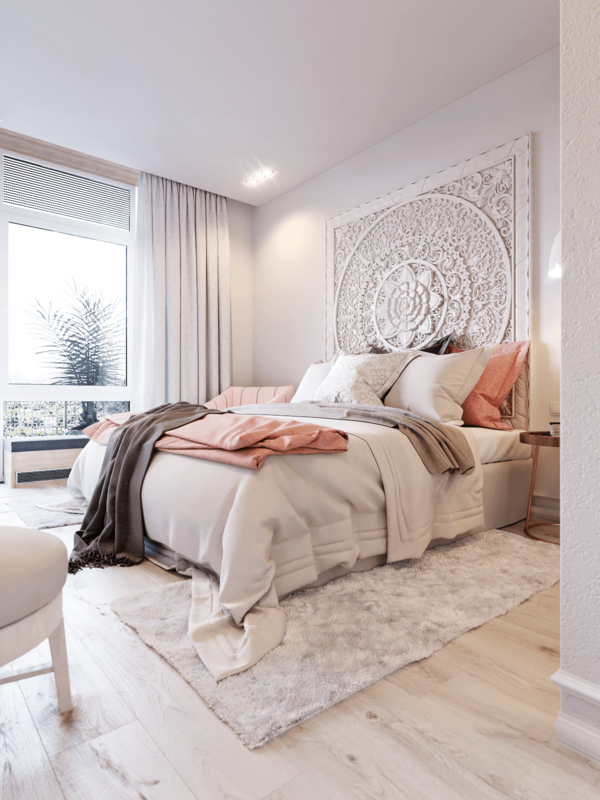 You will love the simplicity that this bedroom decoration will add to your life so much that you will not be able to wait to kick off your shoes and relax! 11) Well, if you can’t go on vacation, then why not recreate it in your bedroom? Don’t you just love the sleek and simple decor of your favorite tropical hotel room? Bring that luxurious feeling home with these bedroom decorating ideas. Using the natural look of wood and beige is the perfect way to create your own tropical oasis. Add a touch of blue with a palm tree and you will forget you ever came home from that sunny vacation! Nature gets a modern makeover in this designer bedroom fit for two! The grey and gold colors give the wooden setting a super chic look that is the perfect space to cozy up in after a hard days work. You feel amazing after a good nights sleep in this cozy bed surrounded by the beautiful, natural walls. 13) De-stress in this “Good Vibes Only” bed. 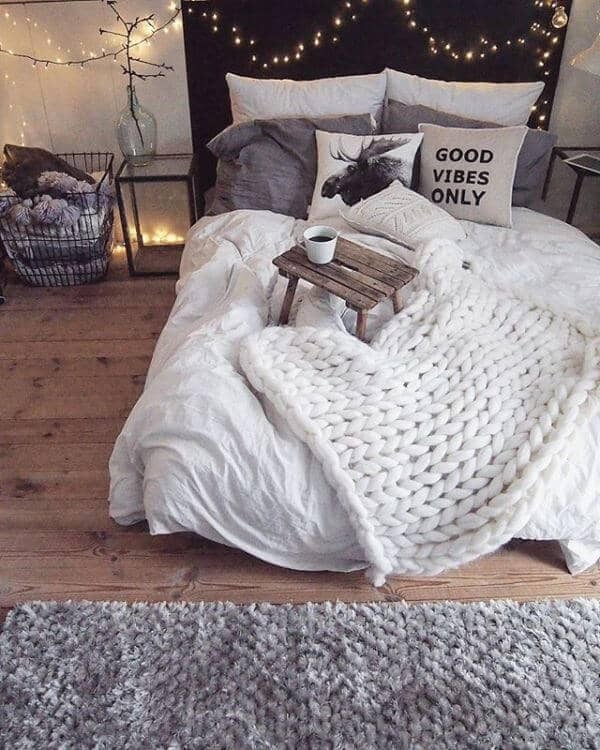 How cozy does this look?! You will be rushing home every day to your space when you fill is with plush pillows and soft blankets. The string of lights will give your bedroom and much more soothing feel than any bright lighting will provide. Add a small coffee table and you have the perfect spot to relax all night long. 14) Photographs tell a story here! The cool undertones of light blue, grey and white give this room a very polished looked. What really makes a statement here are the dramatic photos lined up along the back wall. Pictures are a great way to add some pizzaz to your space and give it some character. 15) This room yells, “feminine power”! Every woman would want to achieve this bedroom idea! This color scheme is super chic! 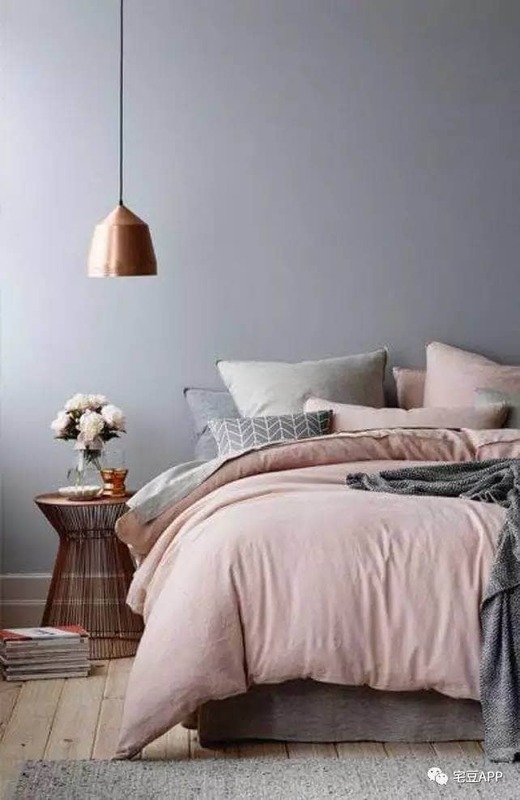 Pink, grey and gold is the perfect combination for and woman’s bedroom in 2018. Not only does it make a dramatic statement, but it is also so darn pretty! You will feel amazing coming home to a space like this every night. 16) Diva meets nature! Impressive and fancy! This bold headboard is so awesome, it is practically an entire wall! Using a gigantic headboard will really make a statement in your bedroom. And that fur blanket? It really does not get anymore fabulous than that! We love the chic design of this bedroom and it is something you will be proud to come home to each night. 17) Cow heads, Buddha images, and western figures? Proof that you can use your imagination to create a bedroom with your favorite things! This room is super sharp and stylish – even though the decor hardly makes sense! 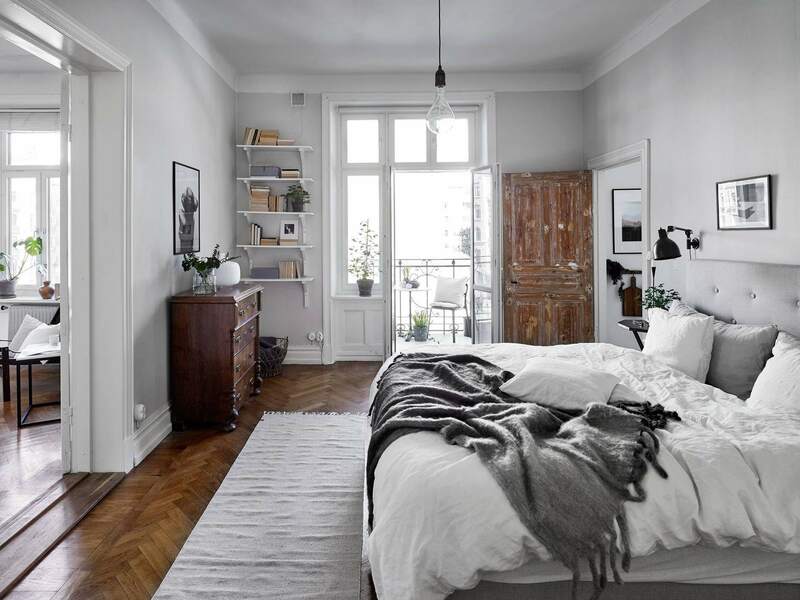 We love that this bedroom combines somewhat random items to create a space that looks modern and purposeful. So, do not be afraid to use your own imagination and put some of you best items together for a similar vibe. 18) Every reader’s dream room! Book storage with a skylight! Just because your space may be small does not mean that the design has to suffer. 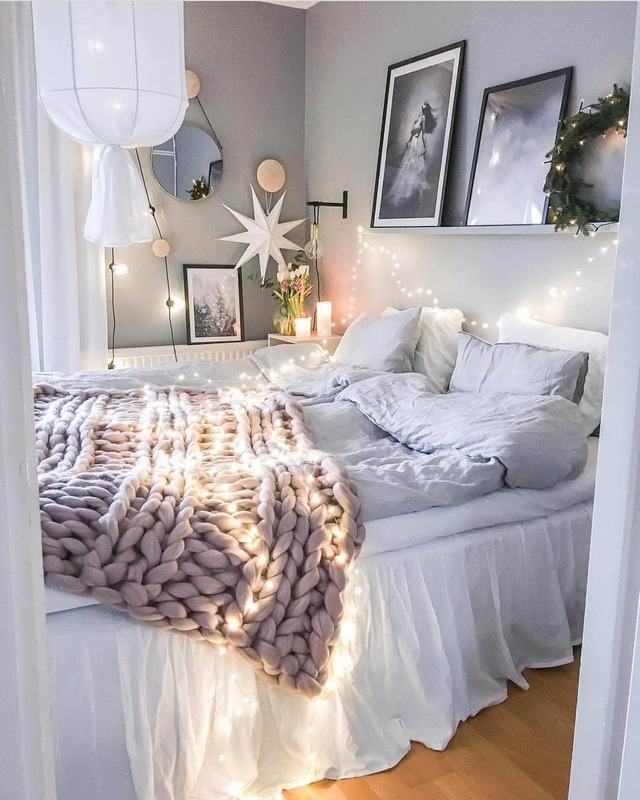 This bedroom may be one of our coziest yet! The sleek look of grey and white give the room a modern feel. All while creating a comfortable atmosphere with a sting of lights and a fluffy blanket. Our favorite part is the skylight – placing your bed right under it will allow you to sleep under the start and wake with the sunshine! 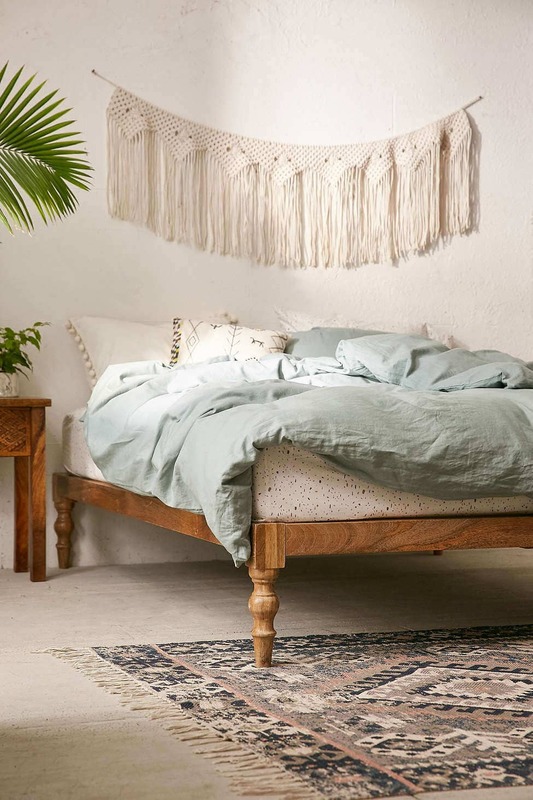 19) Floral design and Hawaiian vibes with this unique basket woven headboard! Your love of gardening can reflect in your bedroom design with this super adorable basket headboard and color scheme. The shades of pink and floral pillow give a nice and happy vibe to the room that will brighten even the worst of days. 20) Sleek, contemporary, and snug! Perfect style for a modern personality! If you are looking for a modern bedroom design, you will love using a grey, black, and white color scheme. It gives this room a sleek and trendy feel. The colors, paired with a comfy throw blanket and a book shelf provides the perfect oasis for you to enjoy your favorite novels. 21) Lovely bed and breakfast theme that exudes comfy! No bed frame? No problem! This design idea may actually make you want to throw that frame away! 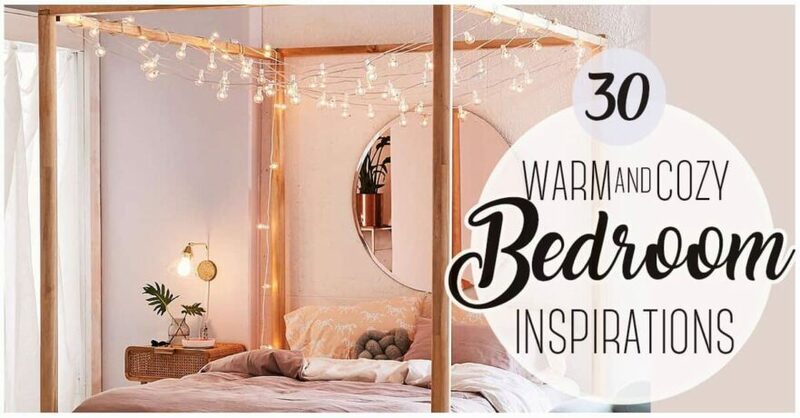 Placing your bed on the ground creates an inviting bedroom atmosphere that will make you want to cozy up under those fluffy blankets every evening. The posh color scheme of pinks and whites are the finishing touches to this modern bedroom. Black, white, and light blue is a color scheme we can really get on board with. This contemporary bedroom design feels polished and cozy at the same time. Adding a luscious green plant is a great way to (literally) add some life to your space. This bedroom will be a great escape from the hustle and bustle of city life. 23) A hammock doesn’t need to be outside in this dreamy twilight theme! 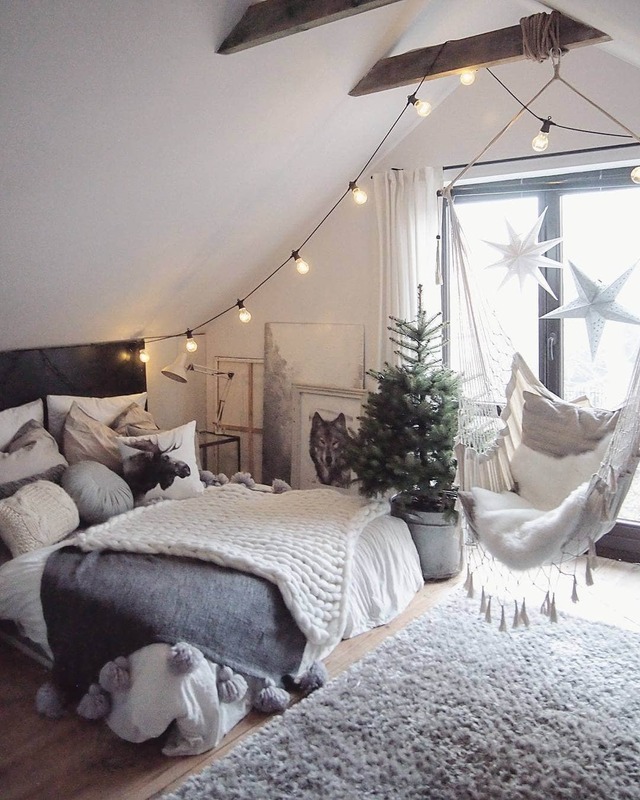 Once again we see how adding a simple string of lights can bring life to a bedroom! This time though, we have a fun arctic theme to enjoy. Add a comfy hammock, a fluffy blanket, and a plush rug is the perfect pairing for arctic decor – doesn’t is make you want to snuggle right up?! 24) It’s obvious black and white will always be striking! Who says we need color? This black and white bedroom is super sleek, yet comfortable at the same time. 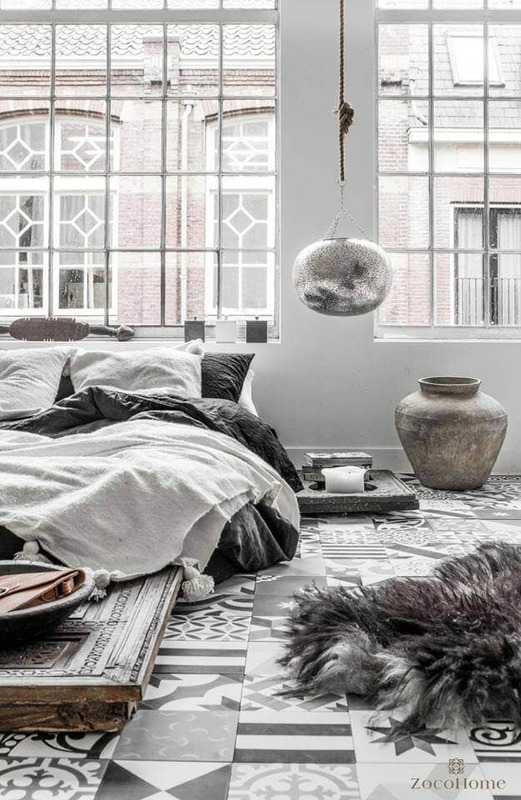 Plush pillows, cozy blankets, and fur rugs will give your black and white space a more cozy feel. 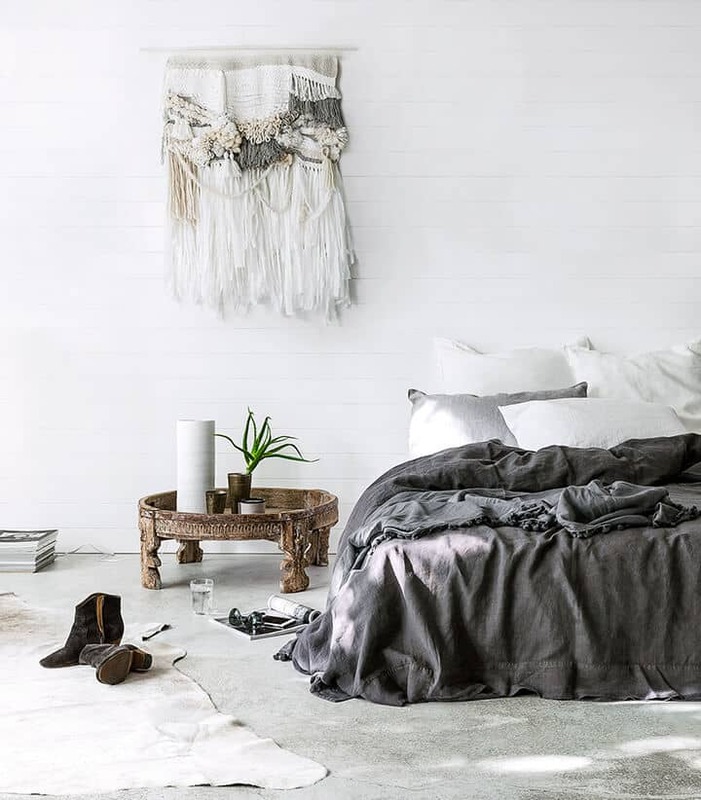 And, we just love how the cactus adds a bit of character to this simple bedroom design. 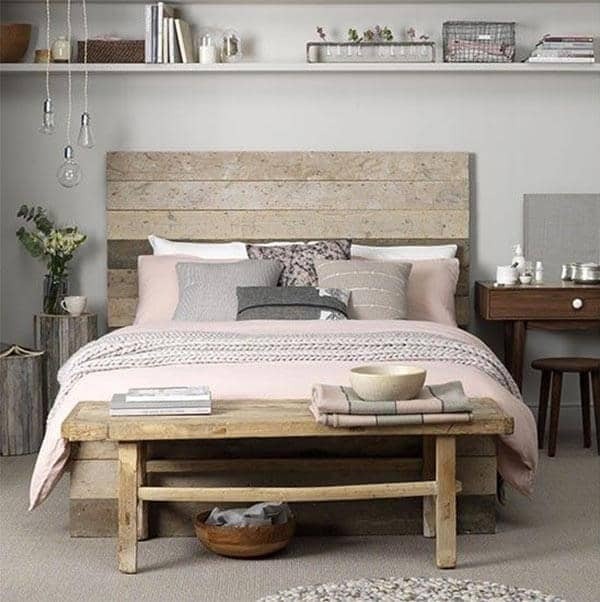 25) Express your character in this bedroom idea with touches of wood! If you have wooden beams in your bedroom than you will love these bedroom ideas. Give that wood a purpose by adding a matching piece. These wooden chairs really pull the whole room together nicely. Also, the light pink and white color scheme make this space very modern and simplistic. 26) Thinking of a more romantic feel, then this style fits! Do you like it? The dog surely does! 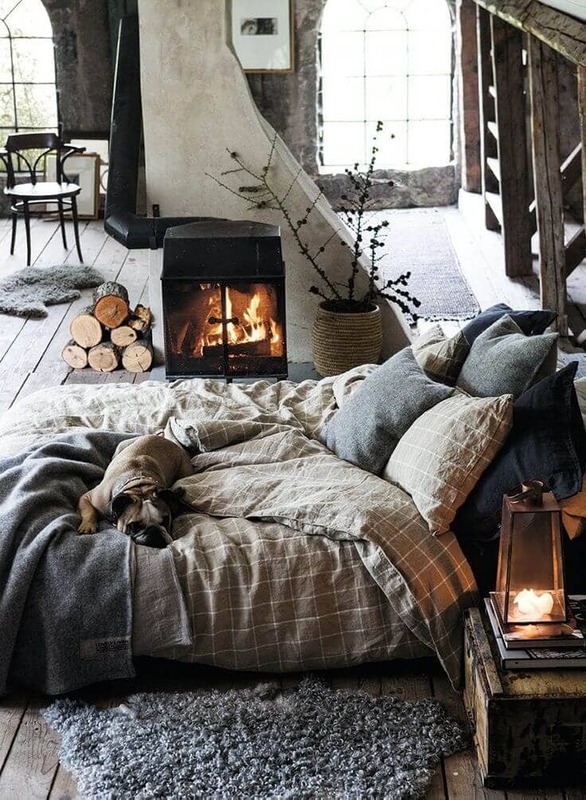 A fireplace in the bedroom? Yes please! We aren’t all blessed with this great addition to our space, but if you have a fireplace then you best use it! Rev-up the comfort with the addition of a cozy bed with plush blankets and you will never want to leave. 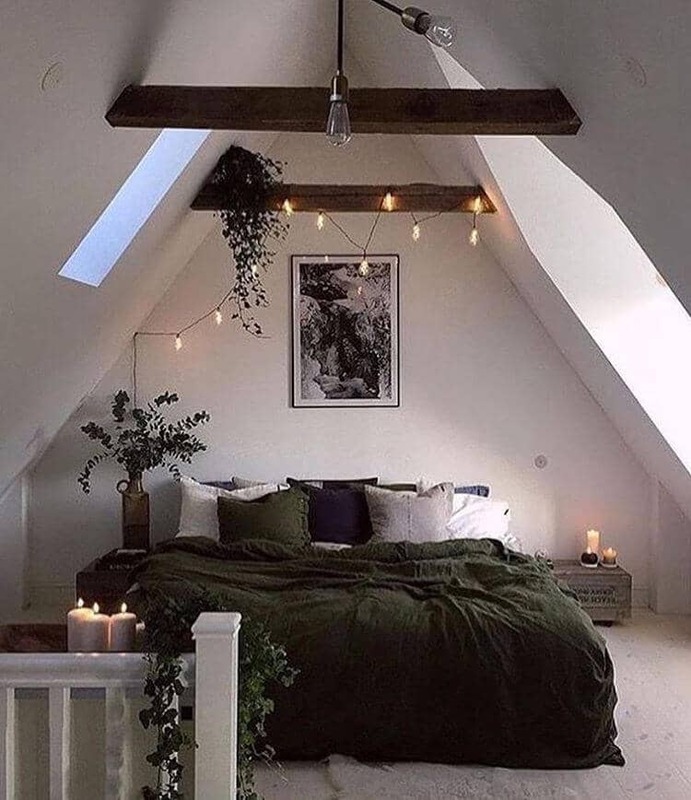 This bedroom is such a nice way to wind down after a long day at work. 27) Vaulted ceilings, green colors, and candles give any nature lover a secret garden in the bedroom! If you have high ceilings and prefer a more natural feel to your bedroom, consider using a green color scheme. 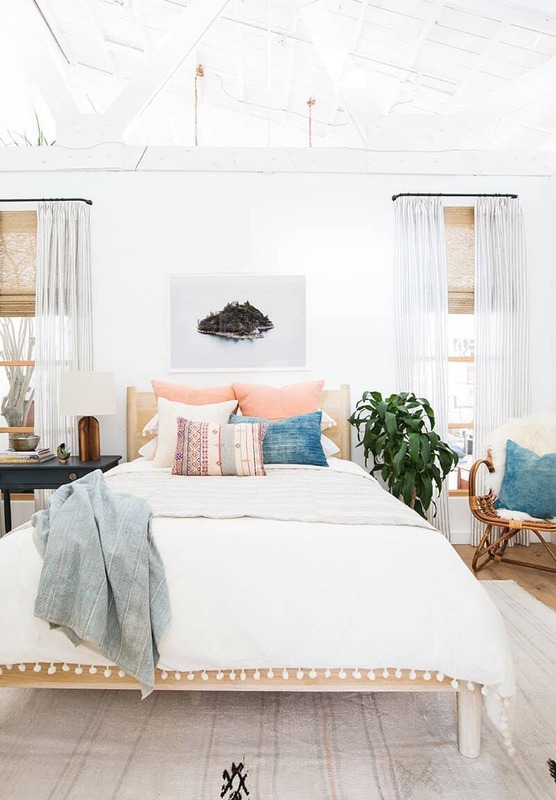 This bedroom will make you feel right at home when you add some of your favorite plants. The cozy comforter, romantic candles, and plush pillows will be calling your name at the end of each day! 28) A plain look that says a lot! 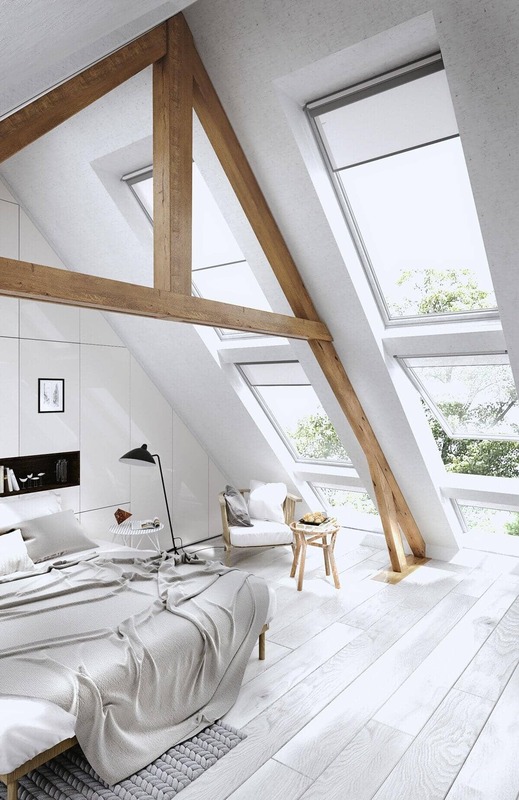 We absolutely love the simple design of this modern bedroom. It has a clean feel, yet it is also something that we can all cozy up to. 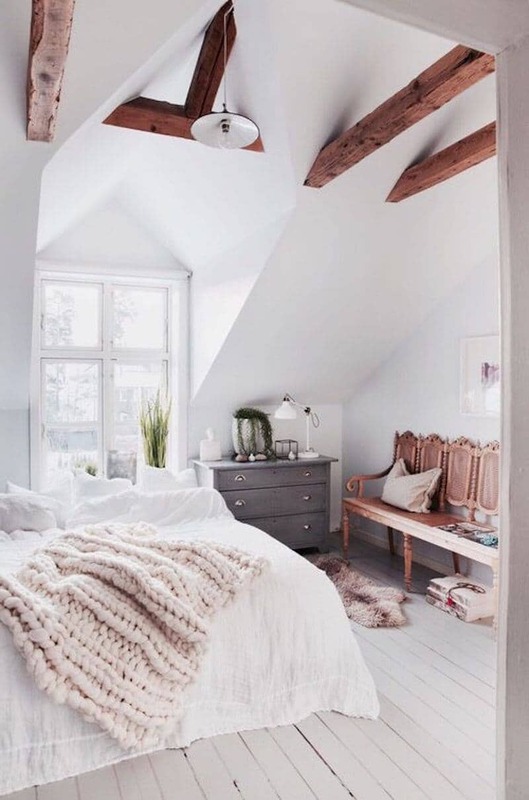 Light grey and white goes perfect with the wooden beam in this bedroom. And, can we all just agree that the windows are absolutely amazing?! You will never want to leave once you cozy up in that chair with your favorite book. 29) Check out this polished bedroom! From little girl to sophisticated young lady. Did you have the perfect princess bedroom when you were younger? It is time to transform your old space into one fit for a queen. The golds in this bedroom design give in a sophisticated feel. You will think you are being pampered each evening as you retreat to your posh space. 30) Fluffy bed with floor length curtains! Glamour never looked so good! 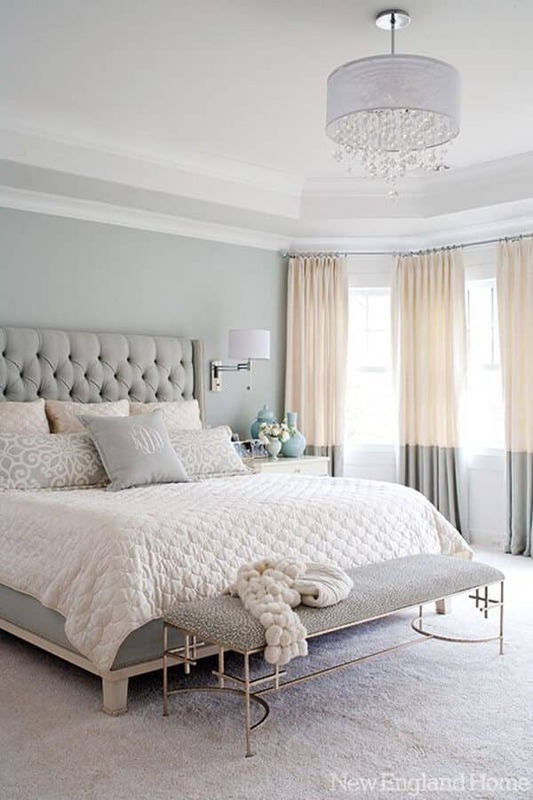 Don’t you just love the glamorous look of this chic bedroom design? When you pair light pink with grey and white, you have a recipe for charm. You will want to snuggle up with those fluffy pillows under that cozy bed spread every evening when you get home from work. Treat yourself to this trendy space to retreat to every night.